Welcome to Day #1 of Chocolate Cookie Theme Week. 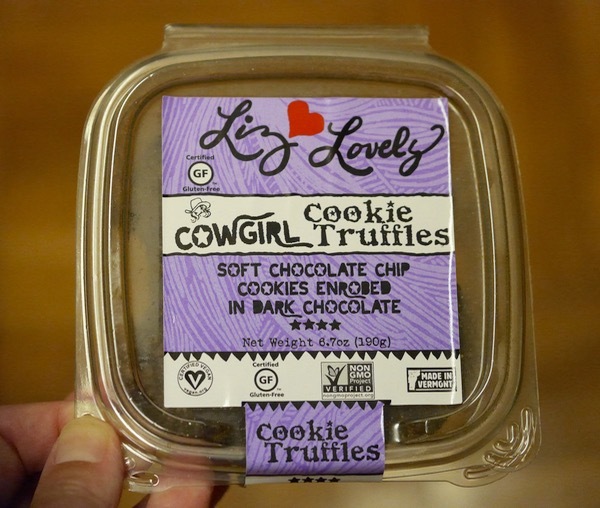 As with all other chocolate items on this site, these Cowgirl Cookie Truffles—manufactured and distributed by Liz Lovely, Inc. (Waitsfield, VT)—were gluten free. What are truffle cookies? 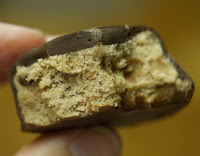 Well, in this case, these rich confections were thick, soft chocolate chip cookies completely covered in dark chocolate. One was enough to satisfy, so it's possible that this container could be enough to share with five others. 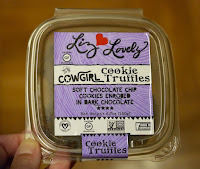 Cookie Truffles (flavors) offered by this company include: Cowgirl, Moose, Sugar and Mint. These cookies were certified gluten free, vegan and Non-GMO Project Verified.